You can see Note&Do pane in all Microsort Office applications you use: Excel, Outlook, PowerPoint and Word. You can share messages among different documents on the Notes tab and list your tasks on the To Do tab. Just drag text or double-click on the pane to create a note or a task, categorize them with color and pin them to certain Office applications. 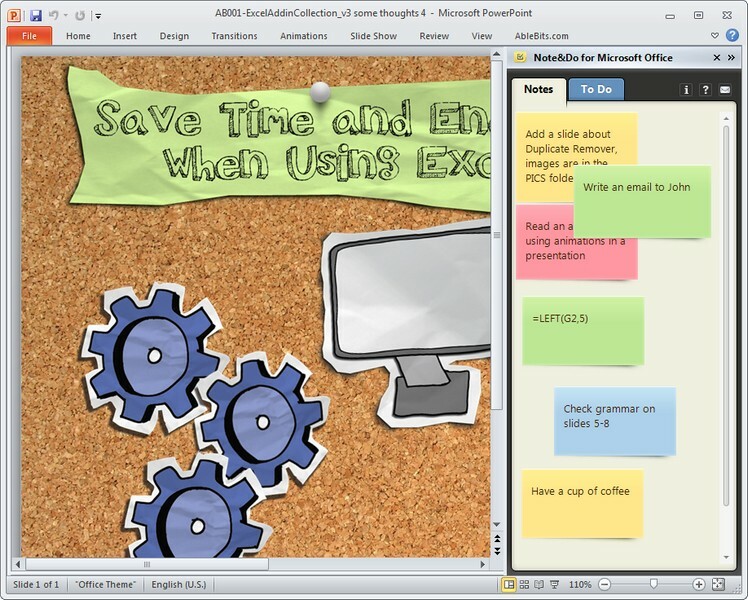 You can drag and drop notes and tasks to your files, complete or re-enable tasks and more. PDF password removal tool efficiently unlock your group of PDF files then permit all user to employing several operation on them such content editing, modifying content or text of image of PDFs. Delete master permissions from PDF documents instantly. Run spell check on many Word documents at once. Word 2000 or higher required.